As spring break rolls around and summer catches up right behind it, it’s no surprise that so many people are thinking about how they can look and feel their best. We’ll all (hopefully) be outside more. The days at the lake and the pool, the nights out on the town, the shorter and breezier clothes — these are things that many people look forward to, and just as many people think of with fear or anxiety. When you don’t feel confident in your appearance, it’s easy to avoid certain situations that make you feel self-conscious or uncomfortable. If the idea of short, skirt, and swimsuit weather starts to fill you with dread, Pierce Medical Clinic can help. Our medical weight loss clinic offers body and aesthetic services to help you regain confidence in how you look — for the summer, and for all the seasons that follow. Find out how you can feel as though you’re preparing your body and mind for summer with our medical weight loss clinic, and contact us to set up an appointment. We look forward to hearing from you! When the new year begins, everyone’s thinking about how they can start to be healthier and look their best. As far back as January, people begin thinking about getting their body “summer-ready.” But usually by February and March, these ambitions begin to die down. If you can relate, it’s completely fine, and there’s nothing to be ashamed of. Just talk with the medical team at Pierce Medical Clinic to see how we can help. Fasting isn’t sustainable in the long-term, but if you’re looking for a short-term solution (such as fitting comfortably into an outfit at a wedding this summer), a fasting program could help. Our programs are designed and run by medical professionals, who can help you safely lose those extra pounds you’re looking to shed. If you think you’re the only one who eats when you’re not actually hungry, know that you’re far from being alone! Nearly everyone eats, even when their body isn’t in need of sustenance. However, if you feel like your appetite and need to eat has gotten to an uncontrollable point, it’s a good time to think about trying appetite suppressants with our medical weight loss clinic. As always, our medical specialists will help determine the best course of treatment for you, based on your goals and your body’s needs. Set up a consultation and start seeing results! Want to spend less time shaving this summer? We think the better question is, who doesn’t? With a few laser hair removal treatments, you could ditch the razors for the summer, and even for the fall. Laser hair removal is a safe and effective way to remove unwanted hair. Especially in summer when we tend to show more skin, we know that you’ll love not having to worry about shaving for the next six to 12 months. Those summer weddings mean lots of summer photos. If you’re feeling a bit insecure about your wrinkles, our medical weight loss clinic offers Botox and Dysport to help smooth out fine lines. Either of these treatments are sure to help boost your confidence as the summer approaches! 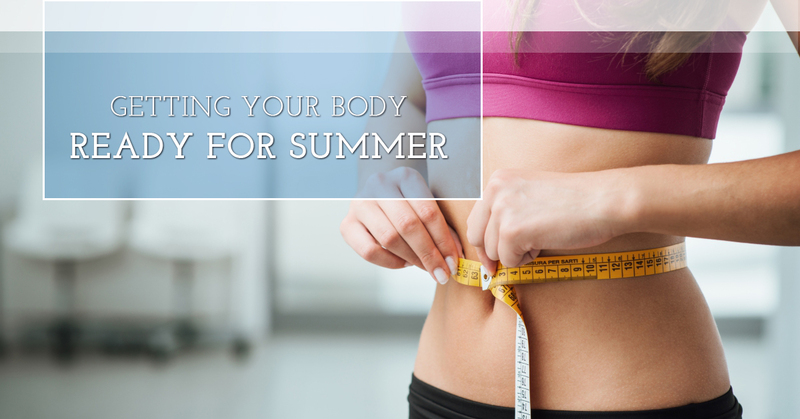 We’ll continue in our next blog with even more ideas on how to get your body ready for summer. But as always, know that your body is amazing. If you already feel confident for the summer, we’re happy for you! If you’re looking to change a thing or two, our medical weight loss clinic can help make that happen. Contact us for your first consultation.